A child with a healthy imagination often views the world with a vivid and engaging viewpoint. This perspective can enable a youngster to experience a passionate childhood and grow up to be a creative and enterprising individual, able to solve problems and find success. You can encourage and develop your child's imagination in a variety of ways from an early age. Encourage free play. Structured activities can be fun and beneficial, but unstructured play with little or no adult direction is effective for cultivating imagination, advises the American Academy of Pediatrics. This type of free play helps kids discover things about themselves and the world around them — and lets them live in a world of their own where anything is possible. Regimented play restricts a child’s initiative and freedom of choice, both of which encourage creativity. If your child wants you to play with him, participate but let him be in control. Choose the right toys, such as toys that are open-ended and ones that allow children to decide how to use them. 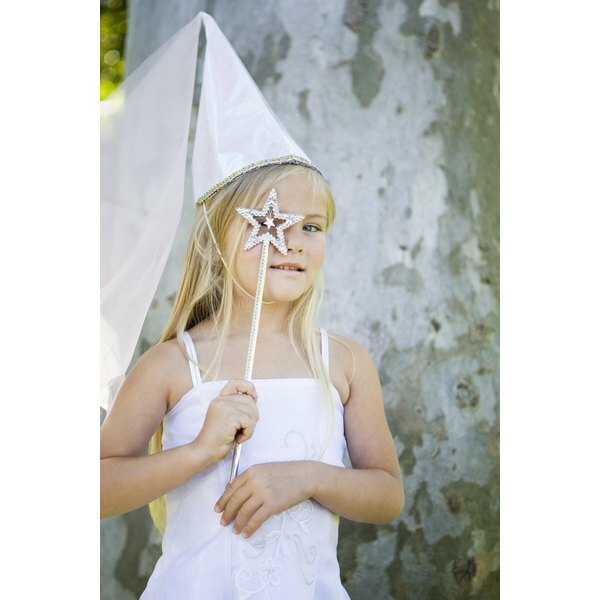 Building blocks, puppets, animal figures and dolls are ideal toys for sparking imagination. Avoid toys that only require kids to press a button or watch a video. Role-play toys allow kids to play make-believe, such as playing mommy with a doll, cooking dinner in a play kitchen or building a house with a tool set, offers KidsHealth. Tell stories. Storytelling is the cornerstone of imaginative development and it also provides a great opportunity for connecting with your child. Make up stories about things your child likes and encourage her to make up her own or contribute details to yours. Get crafty. Creating art projects is another way to develop imagination, whether it’s coloring, painting, molding or building. Tactile experiences are important for getting the creative juices flowing. Young children particularly are apt to use color creatively, like painting a blue lion; instead of squelching this type of thinking, encourage kids to create their own vision. Let kids build their own creations, such as robots from used boxes and toilet-paper rolls or silly faces from cut-out shapes. Limit screen time. Watching television, playing video games and spending too much time on the computer curtail your child’s imagination by making up the story for them instead of letting them imagine worlds and outcomes of their own. Screen time also encourages kids to be passive, which is unhealthy for mind and body. You don’t have to cut out TV altogether, however. Sometimes pretending to be their favorite characters can help kids’ imaginations blossom. Try to cut screen time down to one or two hours per day.